How is nervous system working? It functions by sending electrical impulses across a specialized group of cells called neurons. Learn the whole process here. The nervous system is a complex network of interconnected excitable cells. These cells, called neurons, are capable of transmitting an electrochemical signal when appropriately stimulated. Normally, a slight negative electrical potential is maintained in the neurons (relative to the outside) and this is momentarily reversed during transmission of nerve impulse. Activation of neuron cell and generation of a nerve impulse that moves forward from its point of origin is known as action potential. As already mentioned, the inside of a neuron is slightly electrically negative. Moreover, the inside of the neuron is relatively deficient in sodium ions (positively charged) and relatively rich in potassium ions (also positively charged). Normally, the neuron cell membrane is not permeable to these sodium and potassium ions. However, there are specialized channels that open up during action potential and allow for the movement of such ions. When an action potential is initiated, sodium channels open first and this causes entry of sodium into the neuron cell and now the inside of the neuron becomes relatively positive. After this, the potassium channels open up and the potassium from inside of neuron moves out, and the inside of the cell again becomes negative. All the nerve impulses are propagated in the form of this electrical activity caused by an action potential. Neurons are interconnected with each other at specialized junctions called the synapses. Electrical impulse travelling in a neuron is transferred to another neuron at a synapse. Transfer of signal across a synapse usually involves release of specialized chemicals, called the neurotransmitters. When an electrical impulse reaches the end of a neuron, it causes release of a neurotransmitter in the space between the two neurons. The released neurotransmitter binds to receptors on the second neurons and initiates a cascade of reactions responsible for generating new electrical impulse that propagates forward. Some synapses do not require neurotransmitter. In such synapses, the nerve terminals of the two neurons are situated very close to each other and the electrical impulse can "jump" from one to another. Some nerves carry signals for the contraction of muscles. The point of connection of the nerve and the muscle is known as the neuromuscular junction. The signal transmission between the nerves and muscles is somewhat similar to the synapses. When the electrical signal travelling in the nerve fiber reaches the terminal portion of the nerve (near the muscles), it causes release of a neurotransmitter chemical (acetycholine). The acetycholine binds to receptors on the muscles and then initiates a chain of reactions that ultimately result in the contraction of muscle. The nerve terminals are not physically connected to the muscles. How the nervous system works as a whole? The brain and the spinal cord constitute the central nervous system. The brain and the spinal cord are connected to the other parts of the body (muscles, organs, etc.) by nerves. These nerves, together with their neuron bodies aggregated in the ganglia outside the spinal cord form the peripheral nervous system. The peripheral nervous system is further subdivided into somatic nervous system and autonomic nervous system. Somatic nervous system carries the voluntary nerve impulses causing the contraction of the skeletal (~voluntary) muscles in the body. Therefore, this division of the nervous system controls the movements of the body. The nerve fibers of the somatic nervous system are carried in the spinal nerves and the cranial nerves. Autonomic nervous system or the visceral nervous system is the second major subdivision of the peripheral nervous system. It is also called involuntary nervous system because it is not under conscious control of the brain. In some special cases (for e.g. breathing), the functioning of autonomic nervous system can be slightly altered by the conscious control. The autonomic nervous system has control over variety of functions like heart rate, respiration, sexual arousal, salivation, sweating, size of pupils, urination etc. Autonomic nervous system (ANS) is subdivided into two subsystems: parasympathetic nervous system and sympathetic nervous system. Other than these, there are various other sensory receptors in the human body that sense variety of physiological parameters, for e.g. blood pressure (baroreceptors), carbon dioxide and oxygen in the blood (chemoreceptors), lung's stretch (pulmonary stretch receptors), etc. Functioning of all the sensory modalities is organized on same general outline. 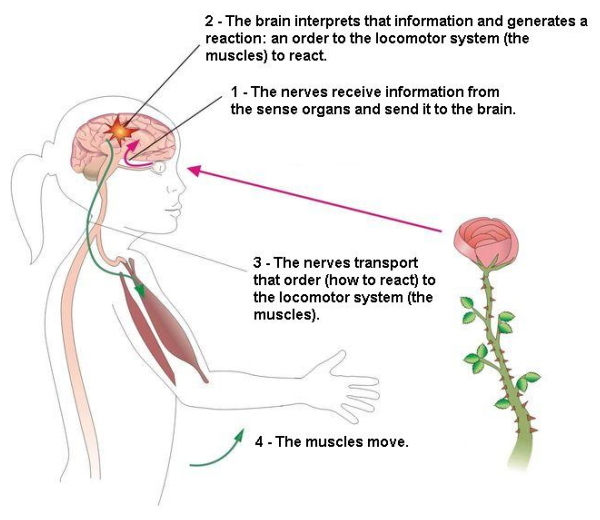 There is a receptor capable of sensing a physiological parameter, and this receptor is linked to a sensory nerve that carries the information to central nervous system. The information is processed in the central nervous system and appropriate response (if needed) is send through the nerves.